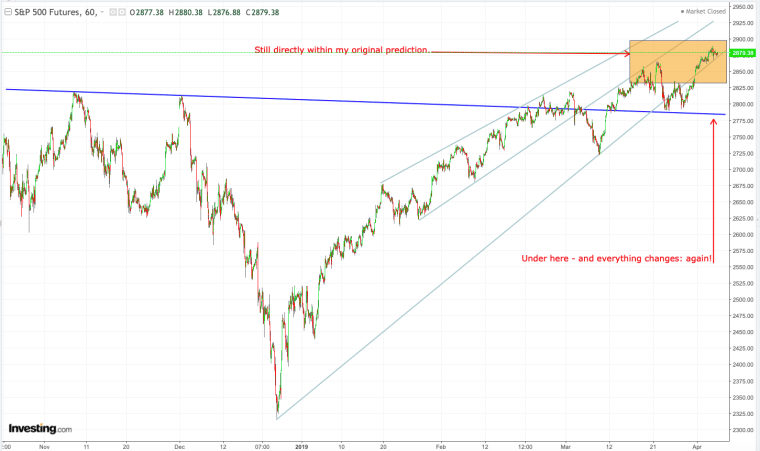 As is the usual, when the "markets" are turbulent, I hear from a myriad of people I usually don't hear from asking for my opinion on the current happenings. When the "markets" are rocketing higher, or seem to be in some form of rocket-ride status, I know the opposite will be true, as in: when my phone doesn't ring - I know it's them. To reiterate, the only reason why the "markets" ramped to where we are currently (my conjecture, of course) was due to the tax cut proposals and subsequent passing. 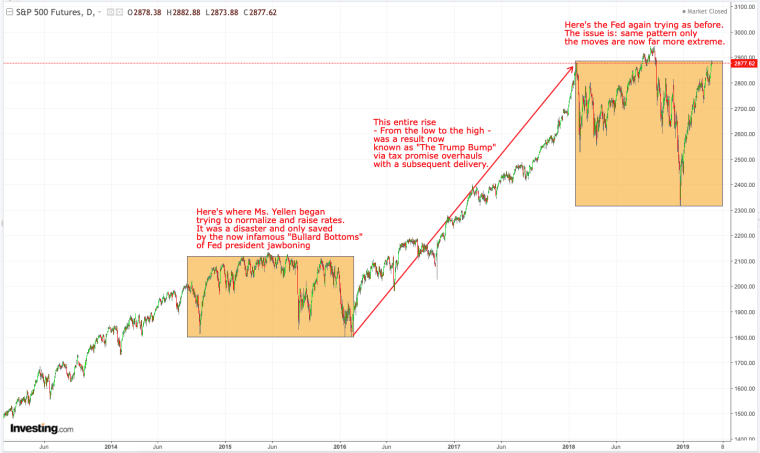 As I've stated prior: The uncanny resemblance of so many similar patterns developing across so many asset classes itself portends that there's true danger lurking. Since I made and have since been chronicling this argument, I used the S&P 500 futures as the current avatar for them. As I type this today nothing has changed from my first observation except for how much time has passed. But the time passing is not invalidating my first interpretation, but rather - is enforcing it. As is the usual, when the "markets" are turbulent, I hear from a myriad of people I usually don't hear from asking for my opinion on the current happenings. When the "markets" are rocketing higher, or seem to be in some form of rocket-ride status, I know the opposite will be true, as in: when my phone doesn't ring - I know it's them. But that's life and I both get it, and I'm not offended. It's the way of the world. The above is of the S&P 500™ futures as I write this represented by daily bars/candles. 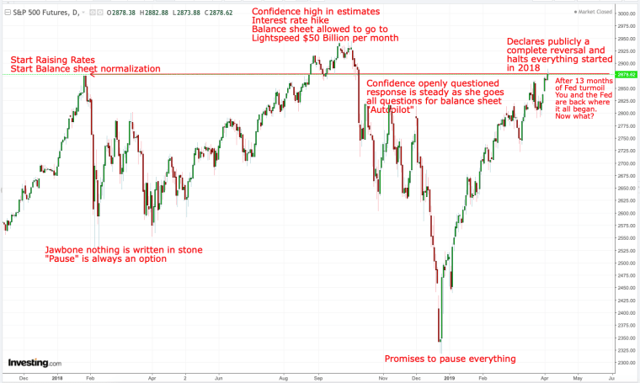 As you can clearly see, you are now currently back to where the "markets" started some 14 months ago in January of 2018 when the now Chair, Mr. Powell first took the helm of the Fed and implemented his former boss, Ms. Yellen's schedule for balance sheet normalization and promise for raising interest rates. On the above, I have annotated the peaks and falls and the Fed's subsequent responses to each. What the above highlights are two very ominous implications. The first: once again the "markets" have proven that without central bank interventionism - they can't function as intended. The second: the Fed had to completely capitulate to the point of sacrificing its credibility to the former - and - the "markets" now rest precisely where they began and the Fed can't do anything about it unless they both cut interest rates and/or implement another QE program. This is not an insignificant dilemma by any stretch of the imagination, that is, unless you're one of those touting "Everything is great, just buy, buy, buy!" snake-oil sellers across the financial media landscape. But I digress. To reiterate, the only reason why the "markets" ramped to where we are currently (my conjecture, of course) was due to the tax cut proposals and subsequent passing. So now here they are at the very top, once again, and the Fed and other central banks have already capitulated on everything they called for prior. Then there are more of what are known as "The technicals" when looking across these "markets." As I've stated prior: The uncanny resemblance of so many similar patterns developing across so many asset classes itself portends that there's true danger lurking. Since I made and have since been chronicling this argument, I used the S&P 500 futures as the current avatar for them. As I type this today nothing has changed from my first observation except for how much time has passed. But the time passing is not invalidating my first interpretation, but rather - is enforcing it.